The Guy-I-Dig and I aren't really big Valentines Day people. We both think that it's a highly over-rated Hallmark holiday that promotes expressing your unconditional love pressures you to shell out all kinds of dough on over-priced flowers, candy and jewelry. So, we're not Valentines people; except for the fact the my female genes kick in and I have a longing desire to be the recipient of a lovely over-priced box of chocolates. 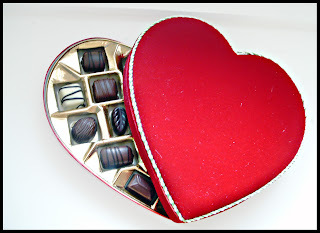 Yes, I secretly LOVE heart-shaped boxes of candy. I can't help it, I love the red decorative wrapping that holds within it a selection of sweet chocolates filled with secret little yummy surprises inside each bite. So, true to form, the GID gave me a box of chocolates. That is why I love that Guy-I-Dig. I made a Red Velvet cake for him. I planned for days to bake this cake- it is such a yummy cake - except that I didn't do something right and my version just doesn't taste the way it SHOULD. And I won't even tell you what a comedy of errors my day was trying to make a cake for my husband! I mean, come on, it's. a. cake! How hard can it be? When all was said and done, at least it looked good, and it was still really tasty despite the miss in flavor - but heck, I'm not a baker. If you want to give it a go, you can find a really great recipe for Red Velvet Cupcakes here. This is my best shot this week. I also made these sweet wax paper hearts. The funny thing is, when I was a little girl, I made wax paper easter eggs and I have always remembered the way they looked in the window of our living room, filled with all the different colors of shaved crayons. Since having a child, I've been waiting to do that craft with him. After all Easter is coming up! But then I got my Martha Stewart email (yeah, I'm on her mailing list) and right there in the body of the message were crayon hearts. Heck, I didn't need to wait for Easter and the window of my new creative space was calling our for someting pretty to be hung there! Unfortunately, being that we were all feeling under the weather, we ate comfort food and went to bed early. So there is our Valentines day. Quiet, simple, perfect. My best shot this week would be that delicious -looking Red Velvet Cake. Heck maybe next year I'll have it down to perfection! Stop by Mother May I to see more color this late Winter day. Wow ... that looks like a great cake ! 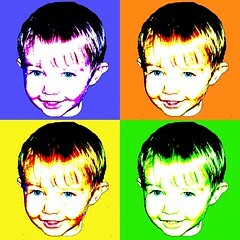 And I love the photo of it !!! It is a GREAT shot ! mmm I am not a cake eater.. but that cake looks SO good! Very nice!! I love red velvet cake. That's what it is right? I also find myself taking pictures of food. the cake may not have tasted good, but your shot sure makes it look tempting! even this early in the morning:). I made Red Velvet Cake once and it didn't turn out either. I chalked it up to just not being a fan of it. It's so pretty though. I might have to try it again. And I love those crayon hearts. Will try those too. Because I also am not a baker really, in my house we go more for taste than presentation since that is what I struggle with...but your cake is absolutely lovely...I love the beautiful shade of red. Guy You Dig must have been impressed. LOL! You have rescued me from the shame of being the only bad baker! LOL. I bet your cake tasted better than my cookies, though. ;o) It sure does look yummy! And I love the hearts, too. The cake looks very yummy! My hubby bought some chocolates and flowers, despite me being on a diet and trying to lose weight!!! The craft looks like fun, we'll have to try that one. Great shots! 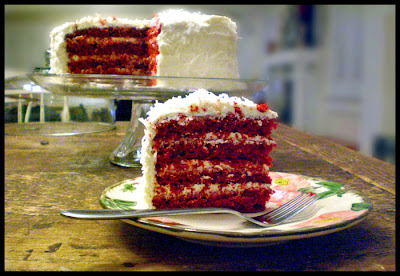 I love the idea of red velvet cake for valentine's day - what a great idea!